Welcome to September, magpies -- AKA the Month of the Glorious Sapphire! 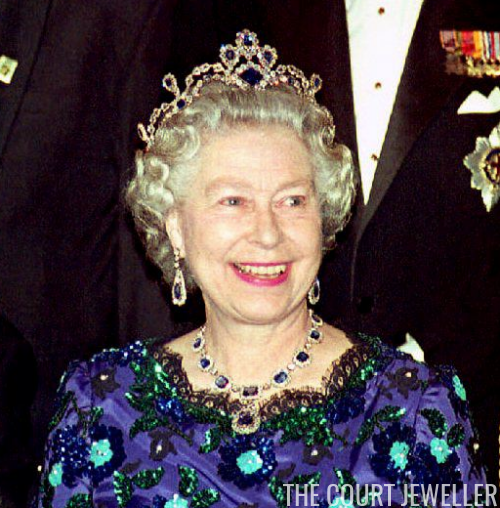 Let's kick things off with a post about a British sapphire tiara that isn't in danger of leaving the country: the Belgian Sapphire Tiara. 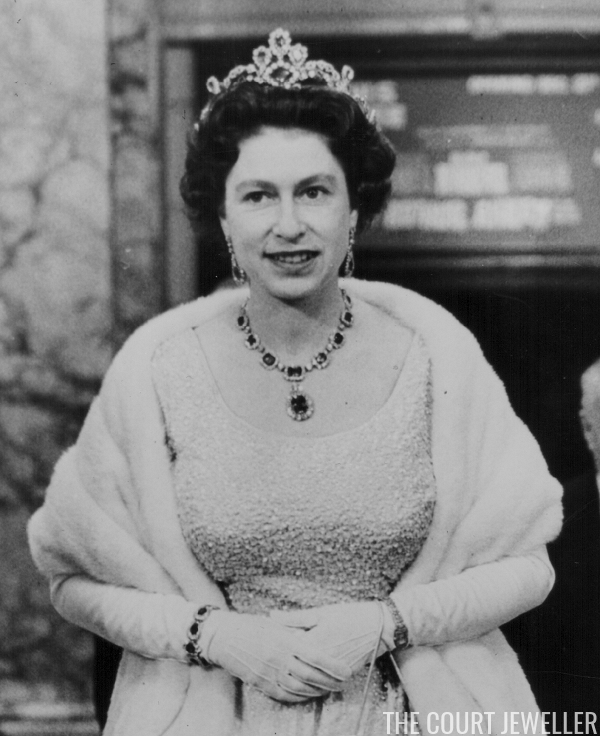 In 1963, ten years after she was crowned, the Queen decided to supplement her father’s sapphires with a tiara. She purchased a piece of jewelry that already had royal provenance — a nineteenth-century sapphire necklace that had once belonged to Princess Louise of Saxe-Coburg and Gotha (born Princess Louise of Belgium). Louise had a bit of a spending problem, to say the least. To satisfy her debts, her father, King Leopold II, auctioned off all of the jewels that had been left to her by her late mother, Queen Henriette. Whether or not this particular necklace was in that group of auctioned jewels is unclear to me, but at some point, the sapphires were definitely sold. 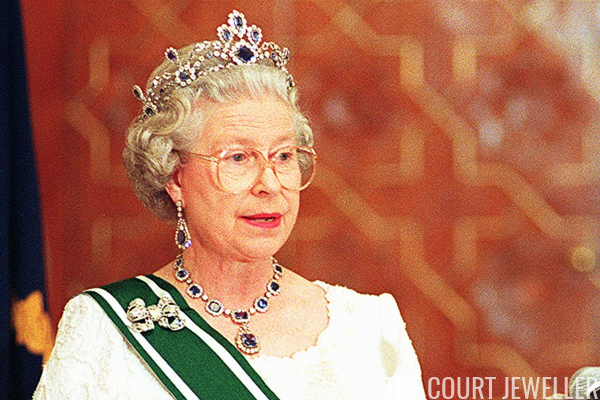 After it was purchased by Elizabeth II, the necklace was set on a frame, and since then, it has been worn by the queen exclusively as a tiara. When you look closely at the piece, its former life as a necklace is clear — gems that now stand upright would have been articulated drops on Louise’s necklace. Apparently the piece wasn’t created to be easily converted back to a necklace, which is a shame — you all know I have a soft spot for royal jewels that can pull double duty. The Queen wore this piece fairly frequently from the '60s until the early '90s, and then it retreated into the royal vaults for decades. Last autumn, however, the tiara made a surprise reappearance at a state banquet for the Chinese president. 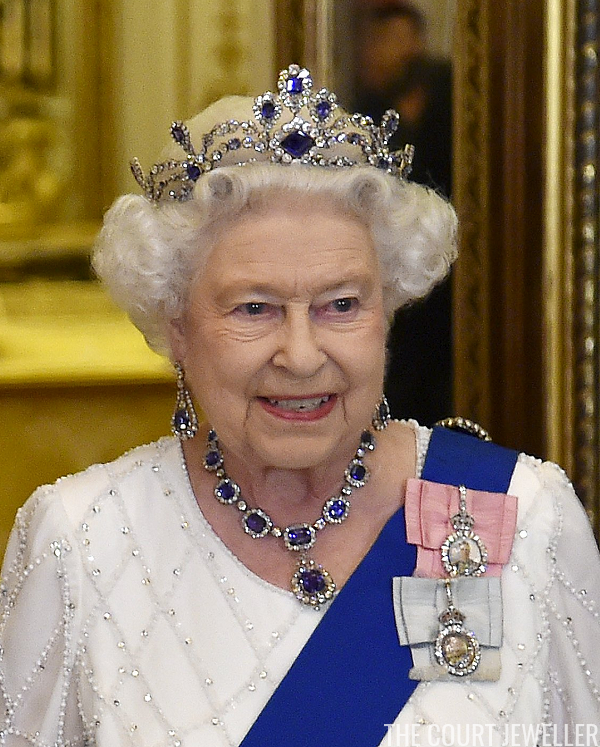 The Queen wears "white" jewels for evening almost exclusively these days, so it was exciting to see her bring out a bit of color for a change.